Since I released The Art of Community, one thing has become evident: the people who are buying it are awesome. If you have bought it you are awesome. If you have not, you too can be awesome. This got my mind thinking. We should put a face to the names of these awesome people. Credit where credit is due to those of you who are supporting a Creative Commons licensed book about building collaborative communities. 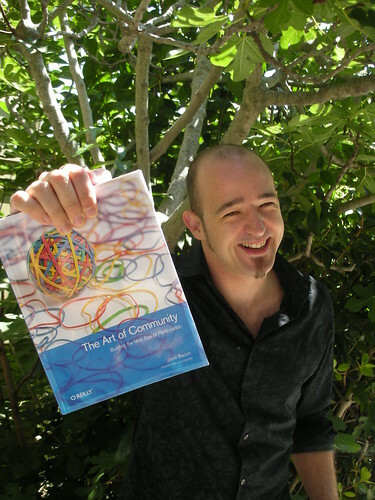 Holding your copy of The Art of Community, have a picture taken of yourself with it. Really go for gold in the picture: extra points are awarded for outfits, hats, exciting locations and comedy faces. Upload your photo to Flickr (or other fave photo sharing site) with the tag artofcommunity and if you use Twitter/identi.ca, use the #artofcommunity hashtag. I will look over all the photos and pick a winner. The winner of the competition will get a special prize. The deadline for the competition is October 25th.